Detectives investigating an attempted armed robbery in the Dunluce Avenue area of south Belfast this afternoon have appealed for witnesses to come forward. Detective Sergeant Sam McCallum said: “At around 12:20pm, it was reported that a man armed with a large knife threatened three males in the area. The man demanded the males hand over their wallets and phones. 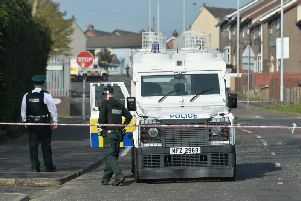 He then chased the men before making off empty handed down Dunluce Avenue towards the bottom of the street away from the Lisburn Road. “We are investigating a link between this incident and a further attempted armed robbery at a house in the Ulsterville Place area . A male armed with a large knife attempted to enter a house, demanding a purse from the female resident inside. The resident closed the door before the assailant could get into the house. The male is believed to have made off towards Donegall Avenue. DS McCallum added: “We are appealing for anyone who may have witnessed anything suspicious in the area at the time or who may have information about the incident to contact Detectives at Musgrave Street PSNI on 101 quoting 580 of 13/08/2018.